16 oz plastic bottle of Power Punch’s famous Oil Supplements. Beats wear, friction and heat. Increases power and mileage. Save money and drive farther. 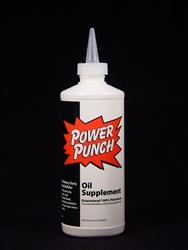 Blends readily with any oil whether petroleum, synthetic or mineral. Use in engines, manual transmissions, differentials or hydraulic systems. 60 years of lubrication excellence still available at reasonable cost.